Monday, January 30, marks the fifth anniversary of a terrible tragedy that occurred in Ghent, West Virginia – a propane explosion that took the lives of four people and injured six others at a Little General convenience store. The accident occurred as an inexperienced worker attempted to transfer propane from a tank located against an outside wall of the store. I am pleased to report today satisfactory progress in the adoption of a number of important CSB recommendations made in our final report of September 2008, aimed at improving training requirements for propane technicians, and at improving emergency response actions by on-scene technicians and 911 operators. The recommendations have largely been adopted and will result in lives saved. 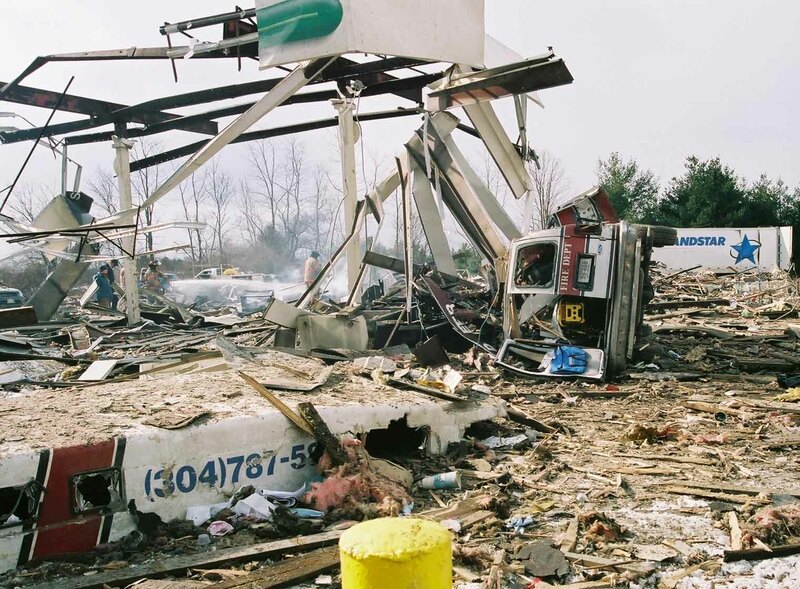 We recall with sadness that the explosion killed two emergency responders and two propane technicians and injured four clerks inside the store and two other emergency technicians standing by outside the store, which had not been evacuated. The store was leveled. The CSB’s final report found that a junior propane service technician was preparing to transfer propane, unsupervised, to a new tank from an old tank located near an outside wall of the store – a location that violated state and federal regulations. The technician removed a plug from the liquid withdrawal valve on the old tank, but the valve evidently malfunctioned, causing an uncontrollable release of propane. Propane entered the store through the restroom ventilation system. The technician had only 45 days of limited on-the-job training with his supervisor. We issued twelve recommendations to a total of nine recipients and most have resulted in what the Board determined to be “Acceptable” action, or are being held as “Open Acceptable” because they are on the brink of completion. It’s particularly gratifying to note that our recommendation to the National Fire Protection Association (NFPA) resulted in the issuing of a temporary standard providing guidance for personnel who work with liquefied petroleum gas. This includes training with a defined curriculum and testing, actions which resulted in an “Open Acceptable” status determination in April 2011. I encourage the NFPA to permanently adopt the training and testing requirements for individuals who work with propane, helping reduce the loss of life and injury among propane workers and potential dangers to members of the public. Our recommendation to the governor and legislature of West Virginia – dealing with training and qualification requirements of propane workers – was closed as “Acceptable” in August 2010 when the State Fire Marshal’s Office reported that the state fire code was updated earlier that year. This kind of action serves as an example for other states. The National Propane Gas Association adopted our recommendation, and we closed it as “Acceptable Action,” in 2010, as a result of NPGA’s communication with OSHA and its work with the West Virginia 911 Council to develop emergency propane guidance for 911 operators. The West Virginia 911 Council on a similar recommendation received the same satisfactory determination from the Board following the council’s action. The Board voted just last month, in December 2011, to close as “Acceptable” the response by Ferrellgas to our recommendation to establish and implement a comprehensive safety management system, as the company has improved its inspection and auditing program to detect and correct safety deficiencies. For many years, Ferrellgas owned and serviced the existing tank, which had been installed in 1994 by another company directly next to the store’s exterior back wall, in violation of West Virginia and U.S. Occupational Safety and Health Administration regulations. The CSB called on the Propane Education and Research Council – which has the critical mission of determining procedures and certifying propane technicians – to revise its Certified Employee Training Program. This would include, among other things, guidance to emergency responders, and procedures for, or a prohibition on, transferring liquid propane from tank to tank. While we were pleased with PERC’s statement in 2009 that they would act on the recommendation, we had hoped for more expeditious action. However, we are retaining its status as “Open, Awaiting Response,” because PERC has indicated it will submit its revised guidance documents by the end of this month. The Board was compelled to vote as “Unacceptable” action not taken by the West Virginia Office of Emergency Medical Services. We urged the agency to require annual hazardous materials response refresher training for all emergency medical personnel in West Virginia. To date, training occurs only once every two years. The CSB believes recurrent annual training is critical for responders who must deal with hazardous materials emergencies such as with propane. To view the CSB’s Little General Store Investigation Information Page (and associated recommendations), click here. To View the CSBs Safety Video on the accident, “Half an Hour to Tragedy,” click here. For more information, contact Communications Manager Hillary Cohen, 202-446-8094, or Sandy Gilmour, cell 202-251-5496. ST. LOUIS (AP) - A crude new method of making methamphetamine poses a risk even to Americans who never get anywhere near the drug: It is filling hospitals with thousands of uninsured burn patients requiring millions of dollars in advanced treatment - a burden so costly that it's contributing to the closure of some burn units. So-called shake-and-bake meth is produced by combining raw, unstable ingredients in a 2-liter soda bottle. But if the person mixing the noxious brew makes the slightest error, such as removing the cap too soon or accidentally perforating the plastic, the concoction can explode, searing flesh and causing permanent disfigurement, blindness or even death. An Associated Press survey of key hospitals in the nation's most active meth states showed that up to a third of patients in some burn units were hurt while making meth, and most were uninsured. The average treatment costs $6,000 per day. And the average meth patient's hospital stay costs $130,000 - 60 percent more than other burn patients, according to a study by doctors at a burn center in Kalamazoo, Mich. The influx of patients is overwhelming hospitals and becoming a major factor in the closure of some burn wards. At least seven burn units across the nation have shut down over the past six years, partly due to consolidation but also because of the cost of treating uninsured patients, many of whom are connected to methamphetamine. Burn experts agree the annual cost to taxpayers is well into the tens if not hundreds of millions of dollars, although it is impossible to determine a more accurate number because so many meth users lie about the cause of their burns. Larger meth labs have been bursting into flame for years, usually in basements, backyard sheds or other private spaces. But those were fires that people could usually escape. Using the shake-and-bake method, drugmakers typically hold the flammable concoction up close, causing burns from the waist to the face. "You're holding a flame-thrower in your hands," said Jason Grellner of the Franklin County, Mo., Sheriff's Department. Also known as the "one-pot" approach, the method is popular because it uses less pseudoephedrine - a common component in some cold and allergy pills. It also yields meth in minutes rather than hours, and it's cheaper and easier to conceal. Meth cooks can carry all the ingredients in a backpack and mix them in a bathroom stall or the seat of a car. The improvised system first emerged several years ago, partly in response to attempts by many states to limit or forbid over-the-counter access to pseudoephedrine. Since then, the shake-and-bake recipe has spread to become the method of choice. By 2010, about 80 percent of labs busted by the federal Drug Enforcement Administration were using shake-and-bake recipes, said Pat Johnakin, a DEA agent specializing in meth. So instead of a large lab that supplies many users, there are now more people making meth for their personal use. The consequences are showing up in emergency rooms and burn wards. "From what we see on the medical side, that's the primary reason the numbers seem to be going up: greater numbers of producers making smaller batches," said Dr. Michael Smock, director of the burn unit at Mercy Hospital St. Louis. It's impossible to know precisely how many people are burned while making shake-and-bake meth. Some avoid medical treatment, and no one keeps exact track of those who go to the hospital. But many burn centers in the nation's most active meth-producing states report sharp spikes in the number of patients linked to meth. And experts say the trend goes well beyond those facilities. The director of the burn center at Vanderbilt University in Tennessee, the state that led the nation in meth lab seizures in 2010, said meth injuries are doubly damaging because patients often suffer thermal burn from the explosion, as well as chemical burns. And the medical challenge is compounded by patients' addictions. "You're not judgmental in this kind of work, but you see it day after day," said Vanderbilt's Dr. Jeffrey Guy. "We've had patients say, 'I'm going out for a smoke,' and they come back all jacked up. It's clear they went out and did meth again." Few people burned by meth will admit it. "We get a lot of people who have strange stories," said Dr. David Greenhalgh, past president of the American Burn Association and director of the burn center at the University of California, Davis. "They'll say they were working on the carburetor at 2 or 3 in the morning and things blew up. So we don't know for sure, but 25 to 35 percent of our patients are meth-positive when we check them." Guy cited a similar percentage at Vanderbilt, which operates the largest burn unit in Tennessee. He said the lies can come with a big price because the chemicals used in meth-making are often as dangerous as the burns themselves. He recalled the case of a woman who arrived with facial burns that she said were caused by a toaster. As a result, she didn't tell doctors that meth-making chemicals got into her eyes, delaying treatment. "Now she's probably going to be blind because she wasn't honest about it," Guy said. In Indiana, about three-quarters of meth busts now involve shake-and-bake. And injuries are rising sharply, mostly because of burns, said Niki Crawford of the Indiana State Police Meth Suppression Team. Indiana had 89 meth-related injuries during the 10-year period ending in 2009. The state has had 70 in the last 23 months, mostly from shake-and-bake labs, Crawford said. What's more, meth-related burns often sear some of the body's most sensitive areas - the face and hands. "I don't think a lot of these patients will be able to re-enter society, said Dr. Lucy Wibbenmeyer of the burn center at the University of Iowa. "They'll need rehab therapy, occupational therapy, which is very expensive." Researchers at the University of Iowa found that people burned while making meth typically have longer hospital stays and more expensive bills than other burn patients - bills that are frequently absorbed by the hospital since a vast majority of the meth-makers lack insurance. Medicaid provides reimbursement for many patients lacking private insurance, but experts say it amounts to pennies on the dollar. Doctors at Bronson Methodist Hospital in Kalamazoo, Mich., performed a five-year study of meth patients in the early 2000s, then a follow-up study in 2009-2010. Their investigation concurred with the Iowa findings. The Kalamazoo study also found that meth burn victims were more likely to suffer damage to the lungs and windpipe, spent more time on ventilators and needed surgery more often. That report also found that only about 10 percent of meth patients had private insurance coverage, compared with 59 percent of other patients. And in many cases, their injuries leave them unable to work. © 2011 The Associated Press. All Rights Reserved.